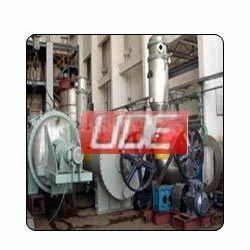 The rotary vacuum paddle dryer is a jacketed cylindrical vessel with a large diameter hollow shaft. Attached to the shaft are hollow paddles provided with specially designed scraper blades, which scrape the entire internal surface of the dryer and continuously move and rotate the material thereby precluding the possibility of material remaining in contact with hot surfaces for protracted periods of time. Over the past 20 years, it has achieved various milestones in this field. A vast database collected through pilot plant trials, product experiments, numerous commissioning & customer feedback make it a safe company to deal with regard to the problems related to filtration & drying. An accredited company, ude has highly skilled manpower, quality conscious work force and dedicated commissioning and service department. Ultra drytech was founded by the late mr. Ashoka prasad, a pioneer in low temperature drying technology and a stalwart in design and manufacture of chemical process, plants & equipment. He was a highly decorated technocrat who had made a name for himself in the chemical process industry. Rajive prasad & sanjive prasad, both graduates of the indian institute of technology, bombay with subsequent post graduation degrees and specialization from us universities are at the helm of activities.